Day Two of my Seven 7×7 Restaurants in Seven Days series. Looking in, you will notice a dimly light, cozy and narrow restaurant. Because it's such a small restaurant, reservations are usually recommended. We had a reservation for 9:15 PM (late dinner!) and we were seated right away. Bar Tartine changes their menus regularly, based on what's in season - but their burger is a staple here and it's what's featured on the 7x7 list this year. My friend recommended that I order the burger with bone marrow, but unfortunately that wasn't available. In an attempt to try their bone marrow anyway, we ended up ordering their Braised Beef Brisket with a side of bone marrow, and I'm so glad we did! 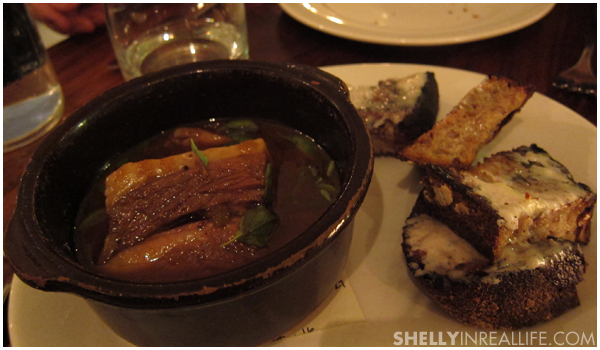 The beef brisket was perfectly braised in an amazing red wine sauce which was only enhanced when eaten with the bread. Since they are so well known for their bakery, it's no wonder that the basket of bread that comes with every meal is amazing. Pair up their bread with a healthy spread of bone marrow and you would be sent off to foodie heaven. However, since I was so full to begin with, I felt like this was a bit too rich for me to stomach. I would have also rather had the bone marrow on the side for me to put on myself. Next up is their burger, which was served on a bun they made, of course. The burger was really moist and is everything you imagine a burger to be. However, I felt that the size bun overpowered the rest of the burger and I ended up not finishing all the bread in my half of the burger. 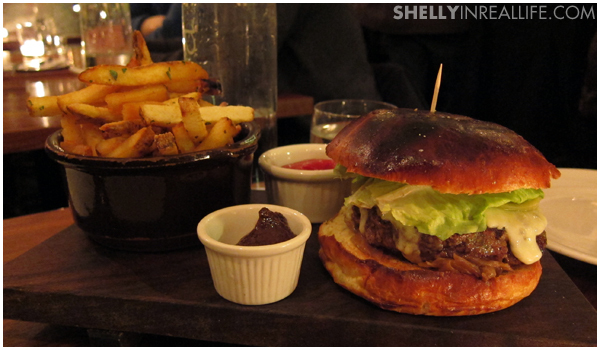 Shelly's Verdict: Bar Tartine's burger was definitely worth trying, but it didn't blow me away. Given, I was already stuffed by the time I ate the burger but it isn't something that I'm dying to have again, unlike the Truffle Burger at Umami. However, I absolutely loved the Braised Beef Brisket and would love to try brunch here. 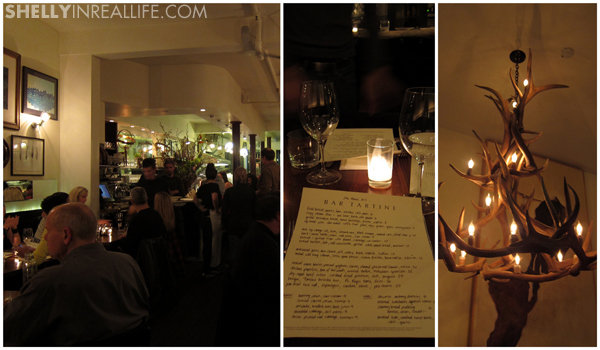 So while the 7x7 item wasn't amazing, I wouldn't just completely write off Bar Tartine. It's definitely worth a try.